The content of the present article is of a delicate nature. 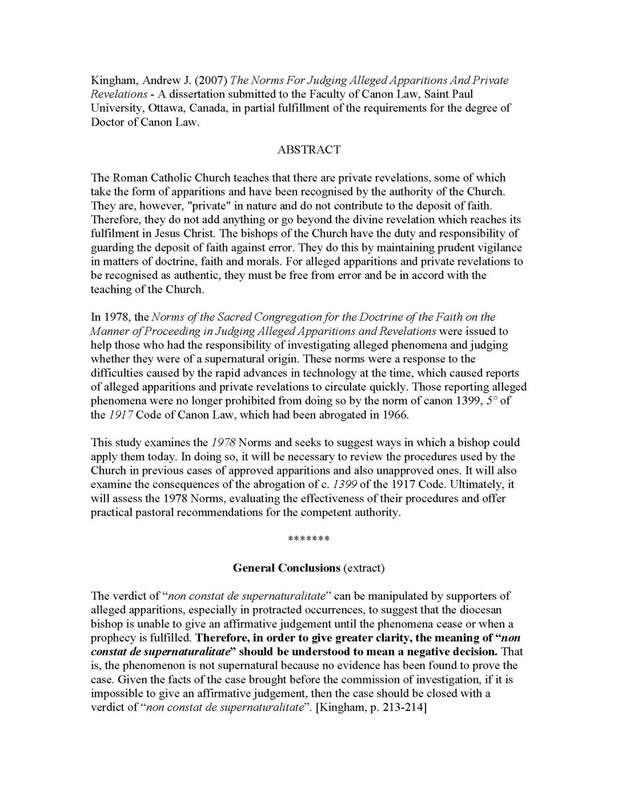 A research about a gross fabrication involving two priests — an internationally known mariologist and a formerly attached Franciscan to Medjugorje who is the father of a nun’s child — has to be led with great precaution and all the necessary documented proofs to avoid the danger of calumnies. The integrity of the former Ordinary of Mostar, the late Bishop Pavao Zanic, is at stake. Since 1986, Fr. 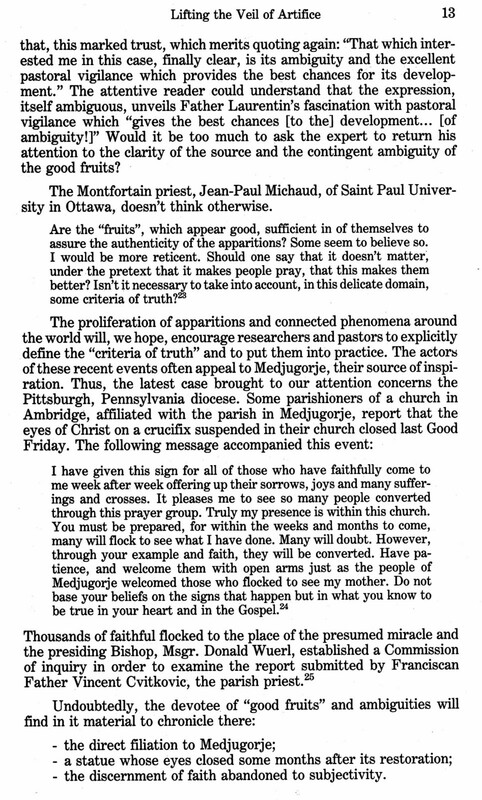 René Laurentin’s version of “immoral acts committed by a Franciscan” is haunting the news and bitter discussions related to the so-called Marian apparitions in Bosnia-Herzegovina. I then asked Fr. 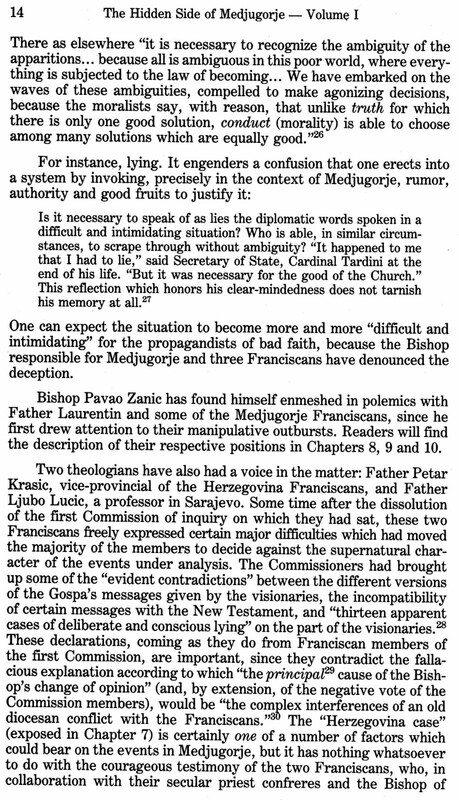 Sivric if he had heard of the “weakness” of a person “favorable to Medjugorje”. He was reluctant to comment on that matter because he thought that it had to remain a “strictly private affair”. When I showed him the said brochure, it was enough to convince him that I should know the truth about the matter. Fr. 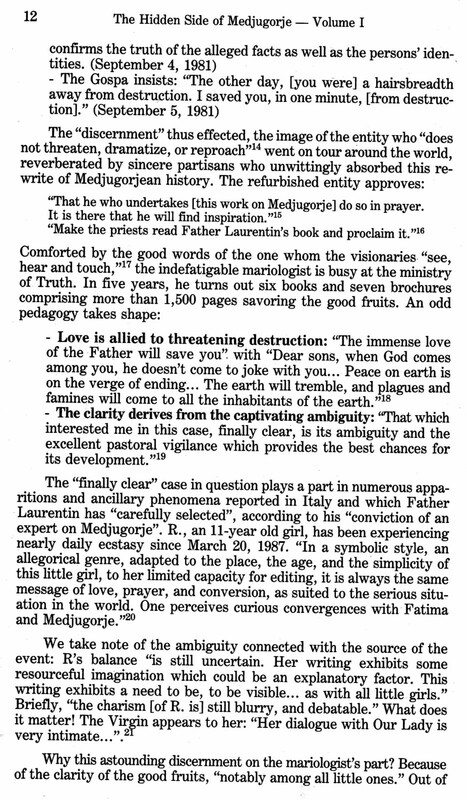 Laurentin alleged that the Ordinary of Mostar was calumniating a certain Franciscan related to Medjugorje by falsely disseminating “all over the world” that the persecuted priest was the father of a nun’s child. 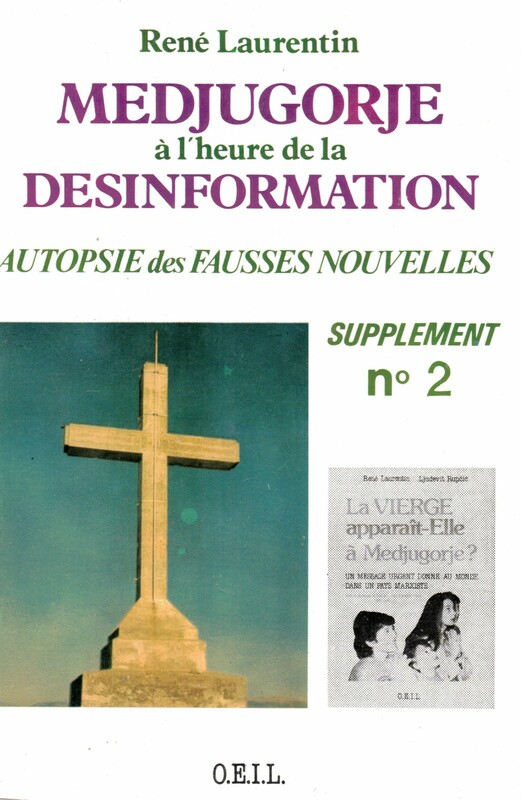 The mariologist assured that he possessed “the complete dossier on the affair, patiently collated,” [“Je le fais en possession du dossier complet de l’affaire, patiemment collationné” (p. 52)]. Those statements triggered my request to Mgr Zanic for his documentation on the case, for the sake of “complete” comparison between the two versions. 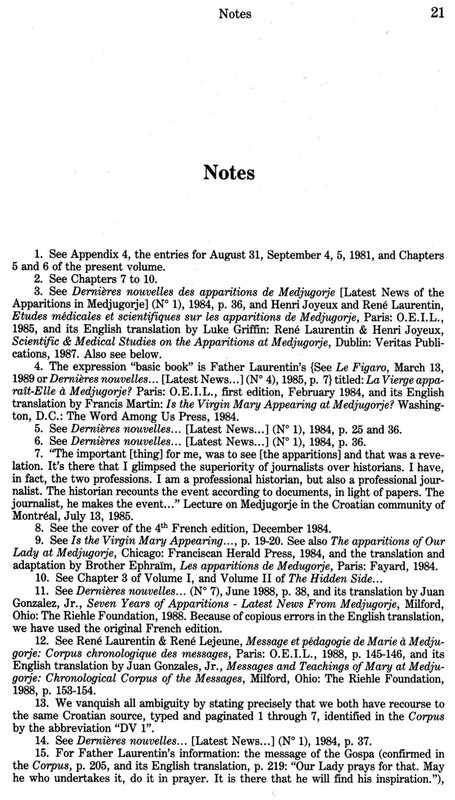 I received primary sources in 1987 and could complete my investigation with the necessary interviews in 1988, shortly after the publication of the French edition of The Hidden Side of Medjugorje. 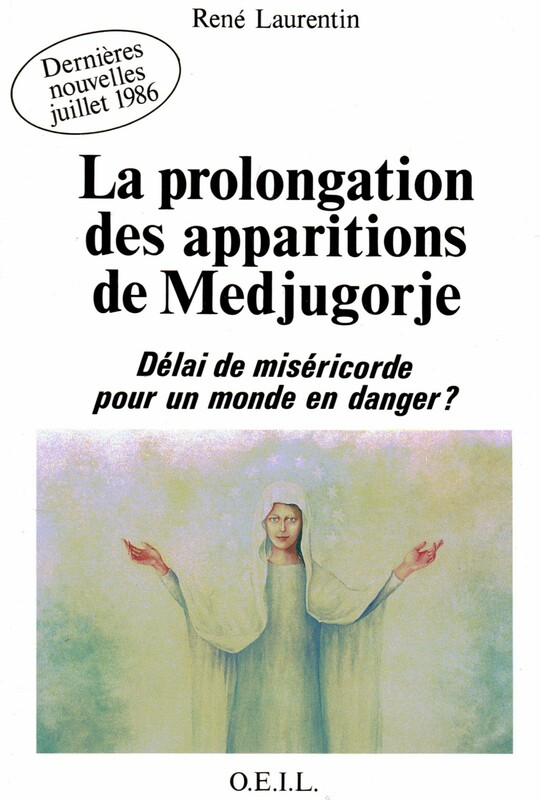 [La face cachée de Medjugorje]. 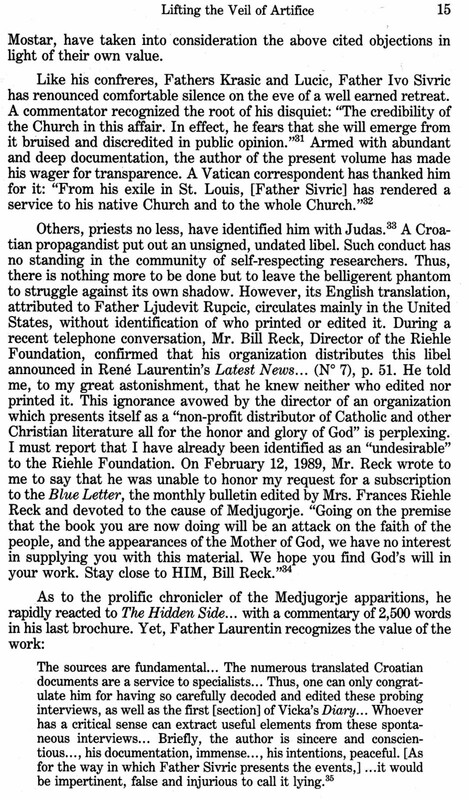 Then Editor of Fidelity Magazine, E. Michael Jones, contacted Fr. 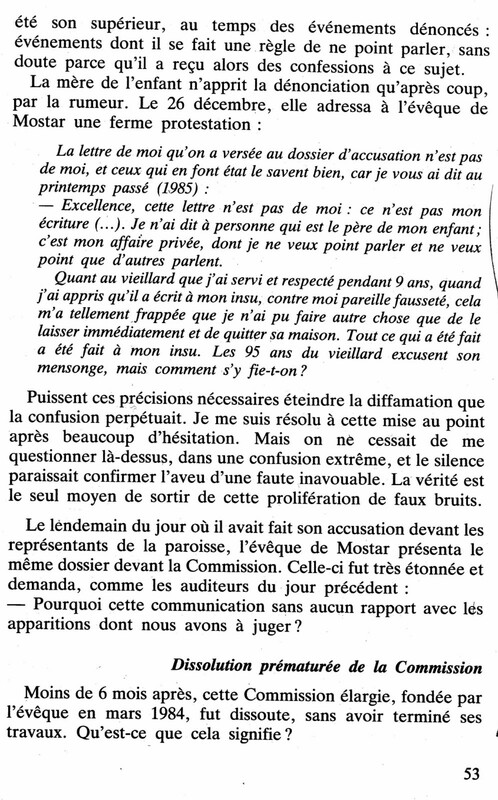 Ivo Sivric and me, having read our French edition published in April and reviewed by the journalist Suzanne M. Rini in their September 1988 issue (p. 42-46). We had hours of telephone conversations, I sent him numerous documents and he visited me in Montreal. He published “The Untold Story” in the September (p. 15-41) and October (20-36) issues of his magazine based mostly on my research material on the “T. affair”, my observations on Fr. Laurentin’s falsifications, Fr. 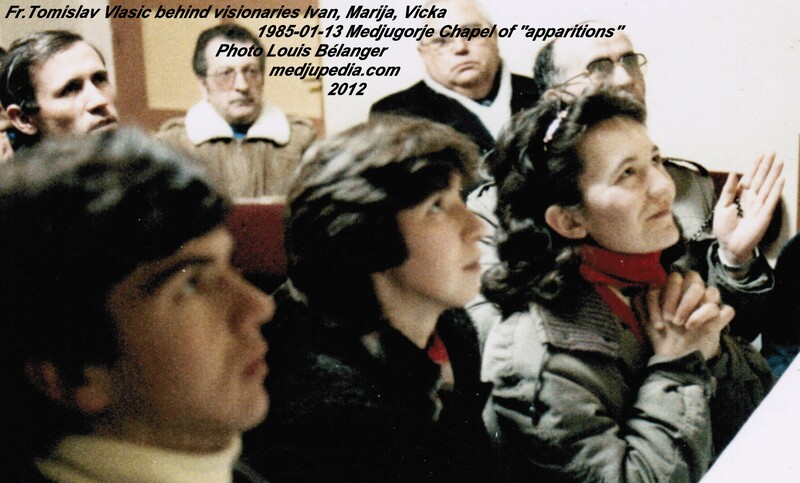 Ivo Sivric’s research + published material and our transcriptions of the taped interviews in 1981 by the Medjugorje pastoral personnel with the visionaries. 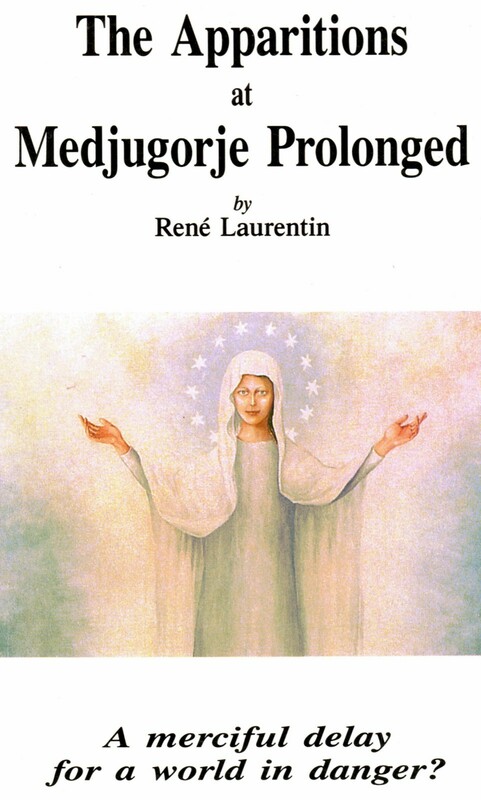 He completed his compilation with the field research led by Mrs. Rini who generously translated La face cachée… into The Hidden Side of Medjugorje published in 1989. 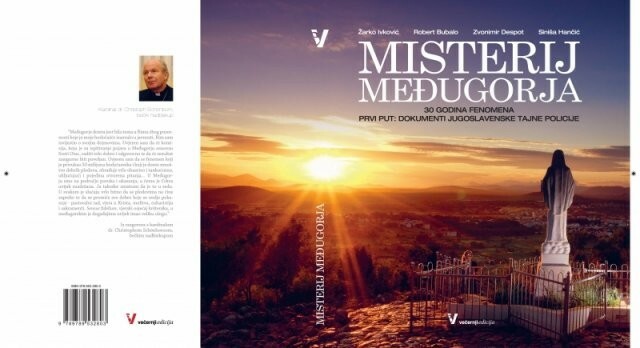 The two articles were also released in a book form by Fidelity Press with the title Medjugorje: The Untold Story. Time passed with the third Commission accomplishing its work, the Zadar declaration (non constat de supernaturalitate), the war in Yugoslavia, the confirmation of the non constat by the CDF, Mgr Zanic’s death and the sanction against the said Franciscan by the Holy See through a Decree of the CDF “for the diffusion of dubious doctrine, manipulation of consciences, suspected mysticism, disobedience towards legitimately issued orders and charges contra sextum”. 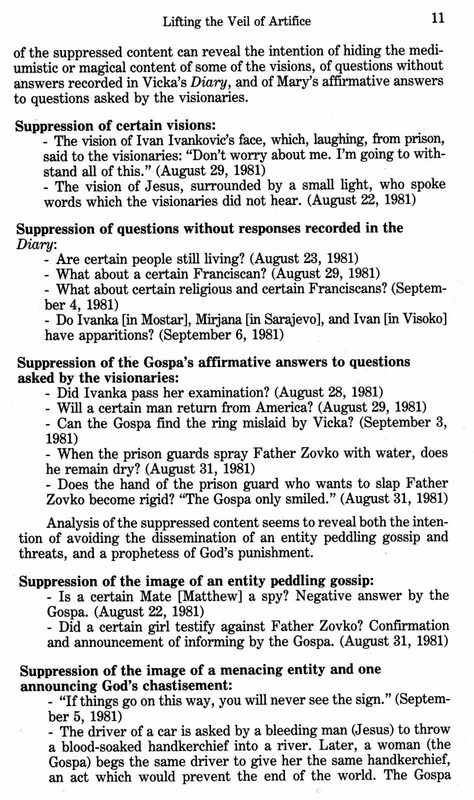 The recent turn of events led by Medjugorje propagandists forced me to bring my grain of salt in that particular debate in honoring the memory of Mgr Zanic — Marco Corvaglia has published two well searched articles “The Communists and the Bishop” (part 1 and part 2) on the same topic — and by publishing the results of my 23 year-old research. According to Zarko Ivkovic, member of a team of four Croatian journalists, Mgr Zanic has been a “tool” of the former Yugoslav secret police (UDBA) in calumniating a persecuted Franciscan. Those allegations have been uncritically transmitted by journalist-vaticanist Andrea Tornielli. 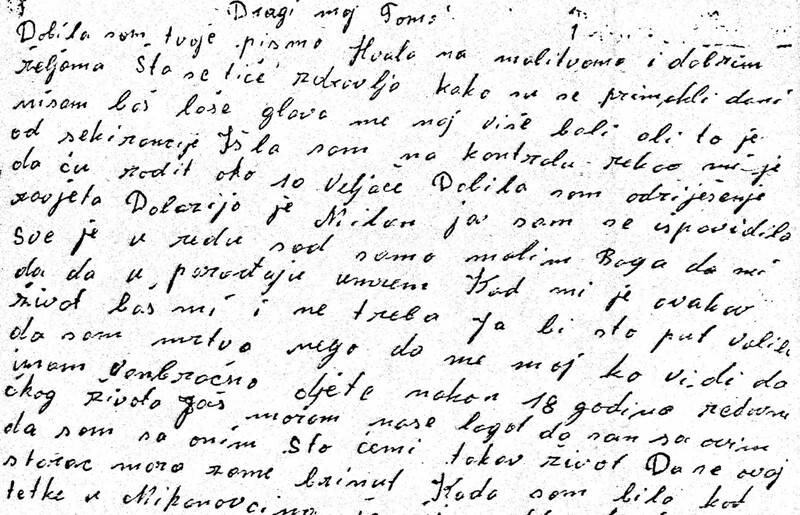 They imply that the Ordinary of Mostar “was willing to accept any document against the Franciscans and against the apparitions, even if of dubious origin.” I criticized Mr. Tornielli by observing that he didn’t “document” anything, didn’t verify anything and copied/pasted very serious allegations without granting his readers any factual historical retrospective. 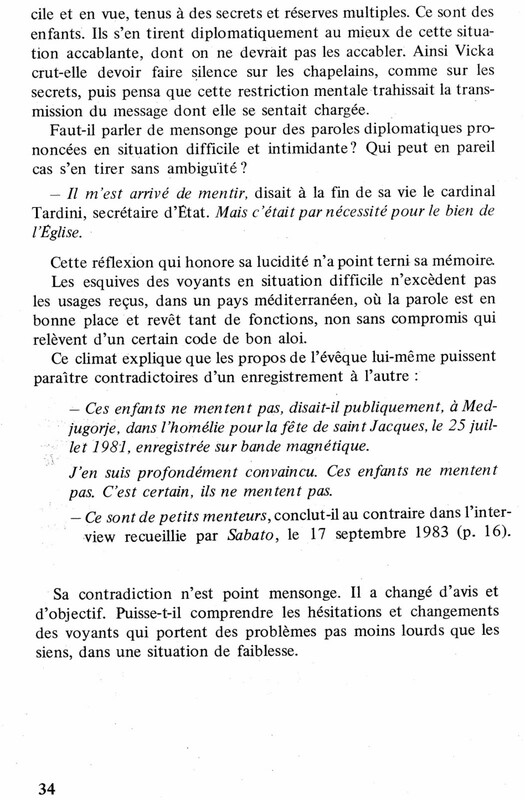 – Laurentin’s unsubstantiated old version condemning Mgr Zanic for having invented Fr. Tomislav Vlasic’s paternity with a nun? 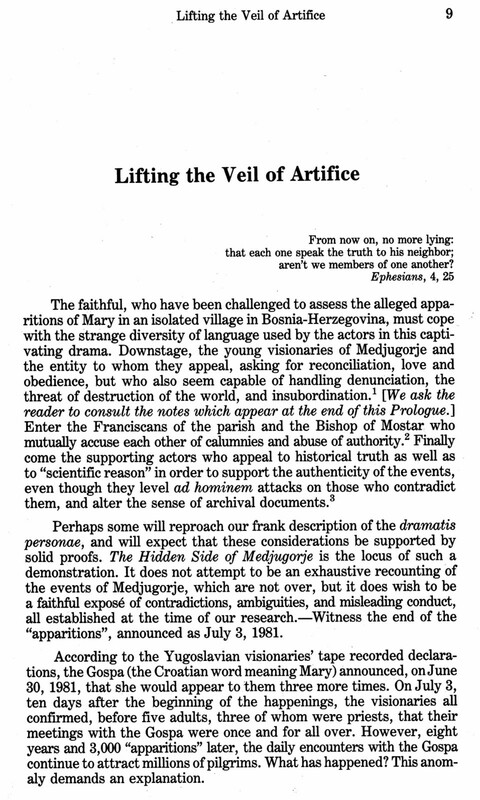 Could that be just another one of the eminent expert’s stories perpetrating gross falsifications of historical documents, as I have pointed out in the Prologue of The Hidden Side of Medjugorje (1989: Lifting the Veil of Artifice – p. 9, 10, 11, 12, 13, 14, 15, 19, notes-p. 21, 22, 23) and here, on medjupedia? – Or the unsubstantiated claims of the Yugoslav secret police of having invented Fr. Tomislav Vlasic’s paternity with a nun and manipulated a naïve bishop to spread the bad news for them? Should we commend the journalists Ivkovic/Tornielli/Marschner for “unveiling that mystery” of Medjugorje? Time has come to put the record straight. We will meticulously examine the version written in 1986 by Fr. René Laurentin (Fr. RL) of the “T. affair”. Its new twist — the communist spy fiction — will fall by itself. In contrast with Fr. Laurentin’s version, the actual facts will be submitted to the readers with the help of primary sources of which I will reproduce pertinent excerpts. The protagonists — public or private — are identified by their real initials. The complete names of some private protagonists are not revealed for the sake of discretion. 14. Letter – 1986-12-01 – from A-M.O to members of a student help organization he founded. 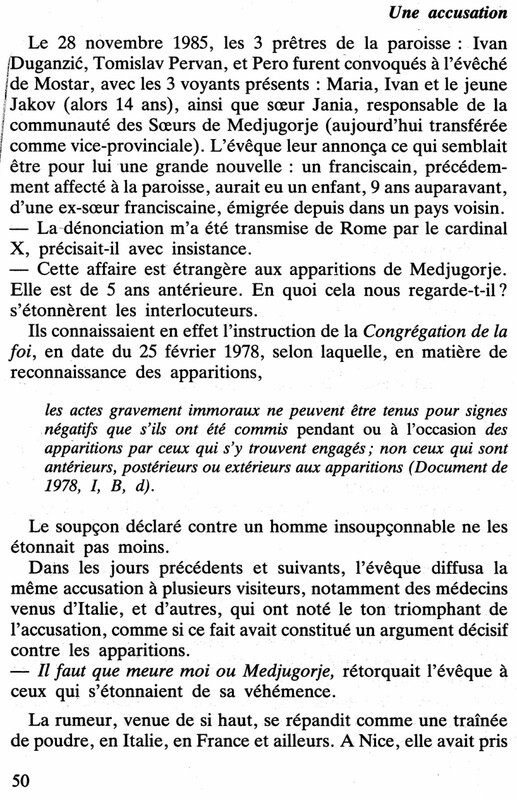 Phase 1, January 1986: immoral act possible, by a Franciscan formerly attached to Medjugorje, but technically not affecting the “apparitions”. 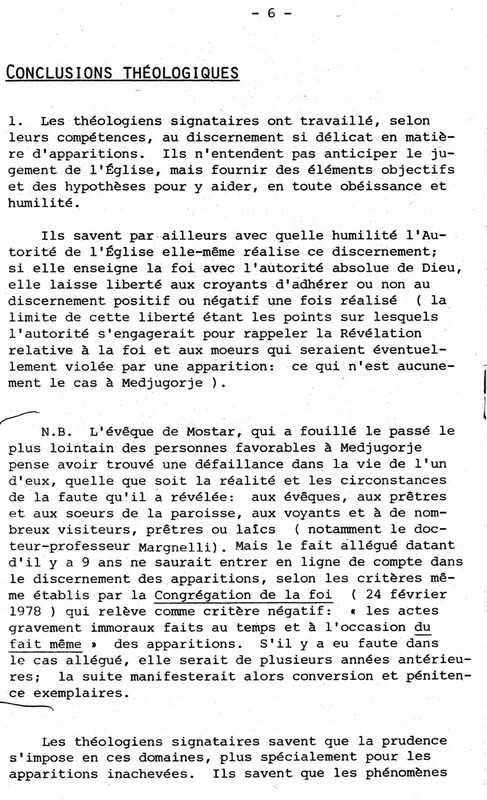 Bishop of Mostar presented as inquisitor (“The Bishop of Mostar, who has gone through the remotest past of persons favorable to Medjugorje…”) [source 11, p. 6]. As we have seen in the preliminary note, Fr. René Laurentin [Fr. RL] is the first chronicler to have informed the public on the “T. affair”. He does not reveal the name of the said Franciscan neither does he deny the existence of a possible “immoral act” attributed to that Franciscan. If true, according to Fr. RL, it precedes the beginning of the Medjugorje events and it is not in anyway connected to them. That “Phase 1” version constitutes the unique one presented in the English translation [source 16] of the original French booklet [source 12]. 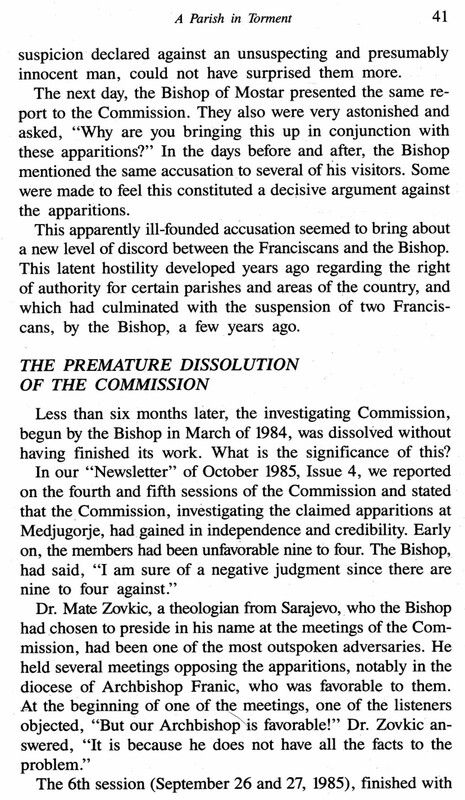 For those who were familiar with the Medjugorje case, it was clear that the Franciscan “targeted” by the Ordinary of Mostar was Fr. Tomislav Vlasic (Fr. TV). The open accusation by the mariologist against Mgr Zanic was very serious and could have devastating consequences for the Bishop of Mostar’s legitimate authority. Unfortunately, the mariologist does not submit his sources, which implies that we have to believe him and hope that his documentation is reliable and valid. 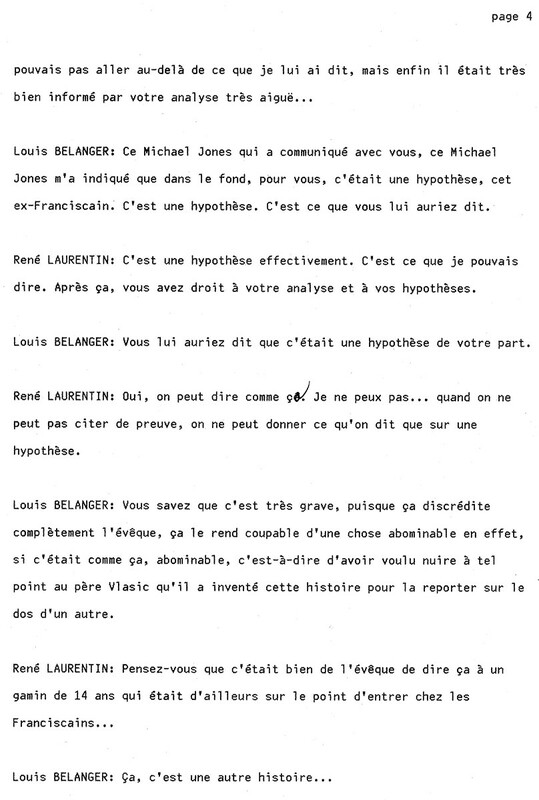 RL assures us that he “possesses the complete dossier on the affair, patiently collated,” [“Je le fais en possession du dossier complet de l’affaire, patiemment collationné” (p. 52)]. Laurentin offers no proof. Moreover, in a letter he wrote to me — he had known her very well — MP denied the truthfulness of that assertion. [source 19] We learn more about RL’s ethical sense than about his afflicted target. 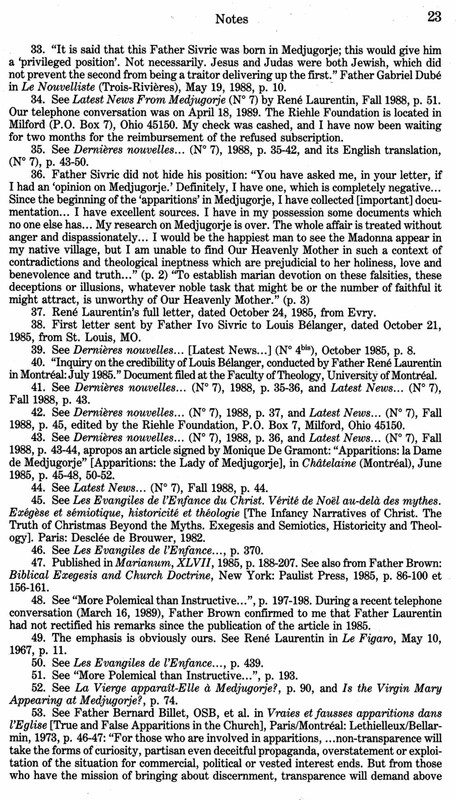 a) The exchange of correspondence between Fr. Tomislav Vlasic (Fr. TV) and MK (former Sr. RK, mother of a boy) and other primary sources [1 to 9 + 14 + 19] show unequivocally that Fr. TV is the father of the child. MK writes to Fr. TV in January 1977, a few days before giving birth to T.: “Who is going to take care of myself? Besides, I am hiding from my relatives like a snake. Tomo (diminutive for “Tomislav”), don’t aggravate yourself, I won’t reveal your identity to anybody – at least not for the time being. I will let you know if I reveal you to anybody.” [source 3] Hence, the father is in no way “presumed”. 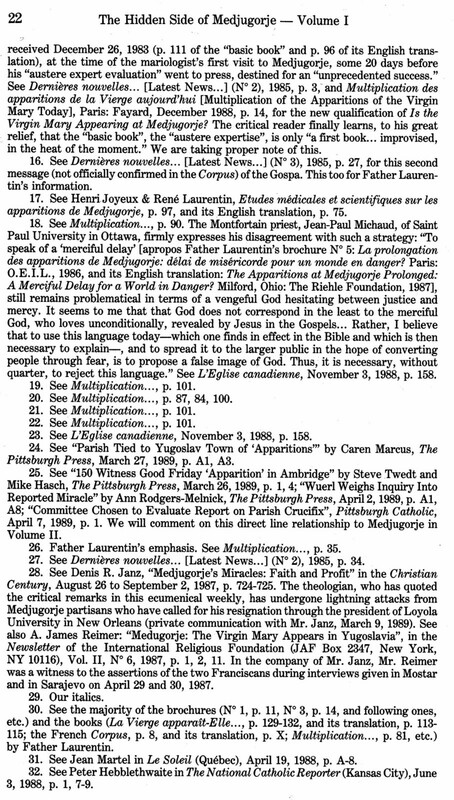 Laurentin’s “truth”, in making MP the father of the child, “kills” the “defamation” against Tomislav Vlasic and, for the good of the Medjugorje Franciscans’ agenda — and of the Italian travel agencies — imperils the credibility of the legitimate diocesan authority which uncovered the “mystery of mysteries” of Medjugorje and could stop the masquerade. If, after examining the evidence, it shows that Fr. 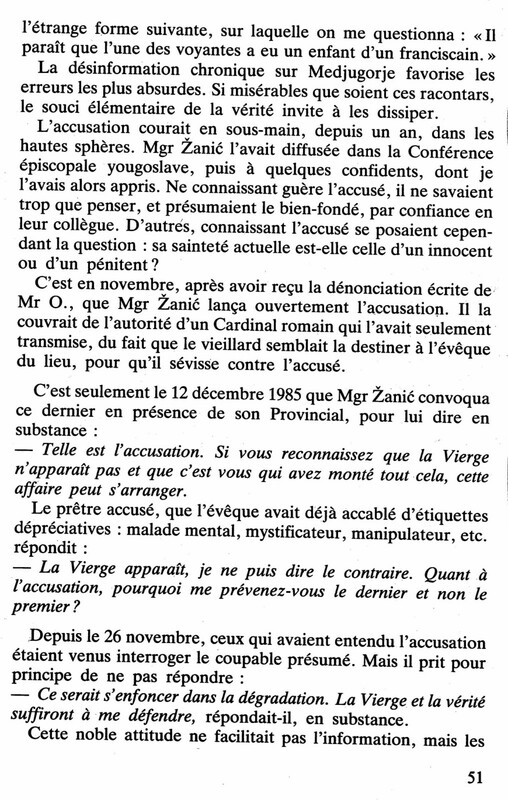 Laurentin and other journalists and vaticanists knowingly — or without professionally verifying available sources — published false statements that injured Mgr Zanic’s reputation and exposed him or his memory to public contempt, hatred, and condemnation, is it not precisely defamation against the Bishop of Mostar that they engaged in? Did the priest/pastor/theologian/mariologist/journalist and his “followers” measure the grave consequences of such actions upon the behavior of the faithful who put their trust in some experts’ or communicators’ integrity and were — and still are — led to distrust the local Church legitimate authority? Educational work seems to be becoming ever more arduous because, in a culture which all too often makes relativism its creed, the light of truth is lacking. Indeed, it is considered dangerous even to speak about truth, thus instilling doubt about the basic values of individual and community life. move beyond the relativistic horizon and come to know the truth about [oneself] and the truth about good and evil. Deep within his conscience, man discovers a law that he did not lay upon himself, but which he must obey. Its voice calls him to love and to do what is good, to avoid evil and to take responsibility for the good he does and the evil he commits. there is the connotation of “Catholic”, with the responsibility that derives from it of being explicitly and essentially faithful, through the daily commitment to taking the highway of the truth. The quest for the truth must be pursued by Catholic journalists with passionate minds and hearts, but also with the professionalism of competent operators, equipped with adequate and efficient means. That is good news for truth seekers. Joseph Cardinal Ratzinger — former Prefect of the Congregation for the Doctrine of the Faith and actual Pope Benedict XVI — has had in his hands, and most probably examined, some of the important primary sources quoted above that have been translated from Croatian into German. Let us read how that happened, as narrated by Bishop Pavao Zanic in his private report [source 8]. I have left Fr. Ivo Sivric’s dictated translation (1986) untouched. The complete names of some protagonists are not revealed for the sake of discretion. In 1981, Fr. Tomislav Vlasic came to Medjugorje without any approval. The bishop heard that he had a child and some other incidents in connection with it but he was unable to prove it and remained silent. In 1983, one Franciscan from Herzegovina told him about it. 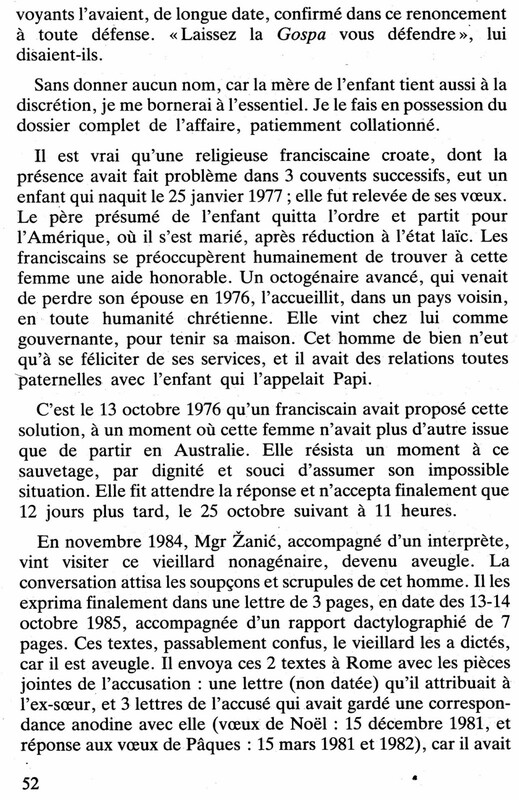 In November 1984, the bishop received from Germany a letter in which a lady by name M. says that she had a child with Fr. Tomislav Vlasic by name T. who attends school already. She begs the bishop to go to see Fr.Tomislav who did not write to her lately and that he reminds him that he has also to care for the child. M. did not sign either her surname or address. Shortly afterwards, the bishop went to Germany and located M. by Mr. A-M. O. in S., near Munich. M. denied that she wrote the letter. But it was clear that there was some sort of manipulation which imposed on her to speak so. The bishop remained for the dinner by M. and later on little T. came home from school; he looked exactly like Fr. Tomislav. The old Mr. O. lost his wife and her child in WW1, and in 1976, his second wife died and he remained by himself when he was 86 years old. After the war [WW2], he was the “father” of poor students — he was a great altruist — and he was known to Cardinal Ratzinger. Nine years earlier, when they telephoned him and asked him if he would take on board and room a girl just before she was to deliver a baby, and if he would not accept her, then she would be forced to go to Australia. He accepted her, even though he did not know a word of Croatian neither she of German. Two Franciscans brought her from Herzegovina. On January 25, 1977, T. was born. M. never told Mr. O. who was the father of the boy nor did she tell him that she was a former nun. She did not want to say that to the bishop either. M. was on the board by Mr. O., and after several years, he got her a job through some individuals from the government of Bavaria where she legalized her residence and she worked for a small wage. Mr. O. considered M. as his own daughter and little T. as his dear grandson. After the bishop left, O. started to think and question. Why was the bishop by M.? Then he searched for some photocopied letters from earlier that someone translated for him in German and he learned that M. was a former nun by name RK and that the father of the boy was Fr. Tomislav Vlasic. This saddened him extremely. He wrote a letter of ten pages about M. and the boy whom he loved very much and about some male voice who would hang up the receiver of the telephone whenever he would answer. That and another letter of M. and some letters of Fr. 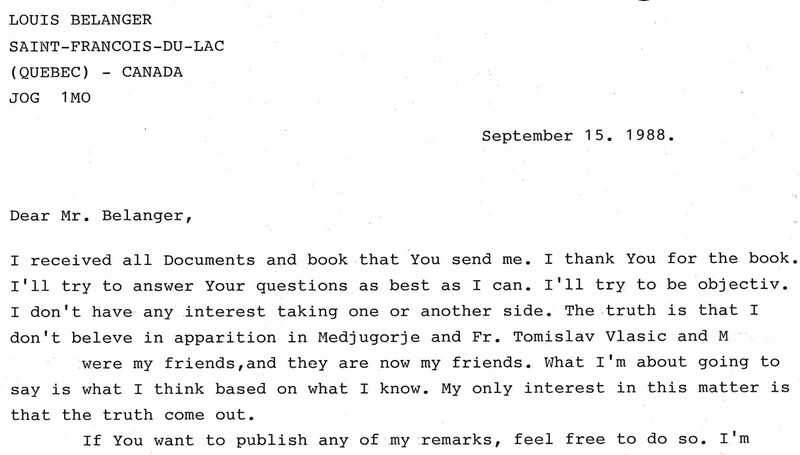 Tomislav Vlasic he sent to Cardinal Ratzinger for the Commission on Medjugorje. 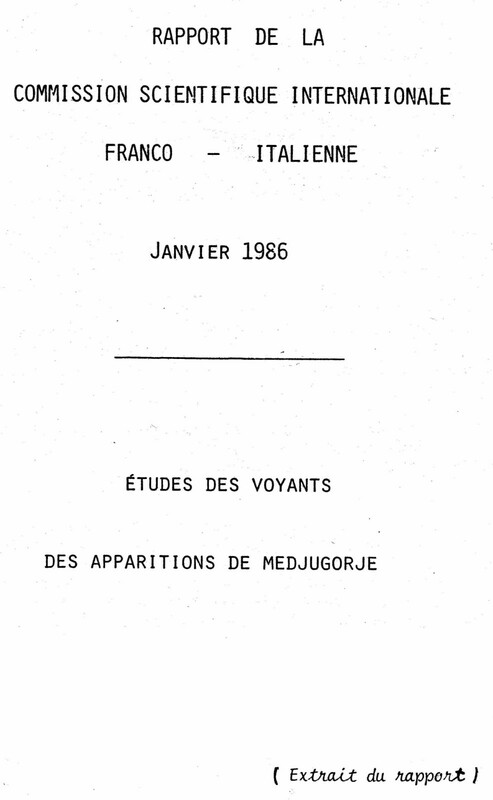 By the end of 1985, the bishop visited Cardinal Ratzinger who gave him this documentation for the Commission. Cardinal Ratzinger told him the history of Mr. O. and his family. After the bishop left, the other party became disturbed. It was obvious that somebody forced M. to negate that she wrote to the bishop. [“Then, two Franciscan fathers of Herzegovina went to the U.S. to ask the former Fr. P. to take the responsibility upon himself for the fatherhood of the boy. P. was in Zagreb with Fr. Tomislav when Sr. R. became pregnant and they wanted to put the responsibility upon him.…” = that controversial statement will be discussed when MP will be presented in Part 2 – The Facts – Remark by LB] Perhaps Mr. O. told M. what he wrote to Cardinal Ratzinger and about persons behind M.
She left S. and went to A.
M. wrote a very rude letter to the bishop against O. who took her off the street when she was in a most difficult situation, uncared for before the delivery of the baby. She left him alone when he was 94 years old, sick and almost totally blind. The same day of her letter, the letter of Mr. O. also arrived full of sadness. Even though the letters which Mr. O. copied clearly speak who the father of the boy was, M. still says that’s a secret which belongs to her and to God. This write up we are multiplying under the title “strictly confidential” and we are giving it to those who are preoccupied with Medjugorje writing and trying to prove that the Gospa is appearing there. We are trying to open their eyes that they may see who is standing behind the visionaries, who is that “Gospa” which speaks and sends messages to the entire world. That’s the “school” or direct words from Fr. Tomislav Vlasic. When it happened that he became the father of a child, when he actually threw into the street a religious woman, he could have abandoned religious status then to take care of her and the baby, or the whole thing over to the care of the administration of his province and then he might have gone some place where nobody would have asked about him and then remain humble religious or assistant or pastor. In this way, he built up the first pulpit in the world from which he is sending messages to the entire world, to the bishop, to the pope, getting from that a tremendous moral and material support and his defenders speak over his high sanctity which is again one more proof for the authenticity of the apparitions. Therefore, in the interest of the truth and in the defense of the Blessed Virgin Mary and the Holy Church, it is necessary to put all this to the knowledge at least to those who blindly believe whatever Fr. T. Vlasic says. The final judgment on Medjugorje is not going to be positive. Fr. T. Vlasic with his extremely irresponsible work during several years brought himself, the visionaries, the faithful, the entire Church to the verge of shame, whose enormity nobody can perceive. The inner division of the faithful, the tension among those who believe in these apparitions and those who do not believe, is especially a grave sin and the negation of the fabricated title: “The Queen of Peace”. The Gospa is the Queen of Peace but here, the title is misused in propaganda purposes and it became the cause of unrest. The Franciscan Province is divided, the diocese is divided, the entire world is divided; they hastened with private revelations, secrets, big sign, threats, miraculous healings, “cures”, everything against the admonitions and orders of the bishop who is the only one authorized in the Church to communicate those things to the world. This has been done to create a situation in which nobody would dare to say anything against the created opinion. Seemingly enthusiasm might turn into just the opposite and have tragic consequences. May God save us from unrest and scandal! One could blame me for publishing a “strictly confidential” document, or excerpts of other private documents. Here is my justification for doing so. I refrained from publishing the results of my research until today, 23 years after its completion… But I feel a moral obligation to intervene, now that new disloyal and dishonest attacks — related to the same poisoned well — are afflicting the memory of a pastor I have known and admired for his integrity and courage. 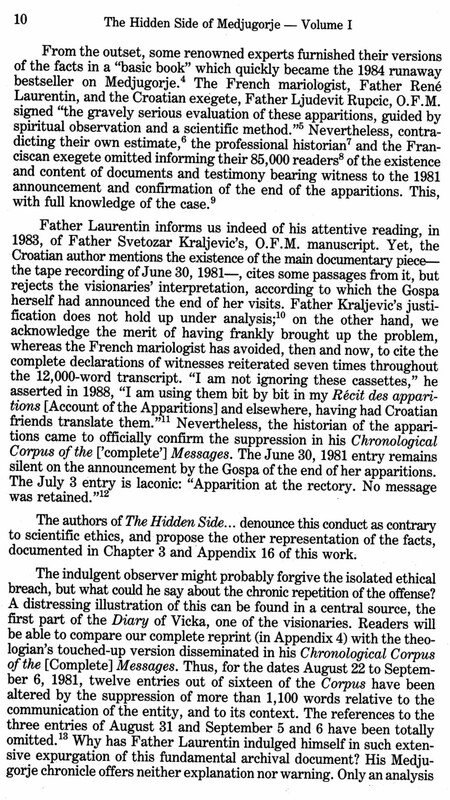 An irresponsible priest and author was the first to uncover the affair in his own way, by calumniating a former nun, contemptuously claiming that she had “made problems in three successive convents” [source 12, p. 52], and instigating public contempt, hatred and condemnation against the former competent Ordinary of Mostar. Other irresponsible authors and journalists have publicly drawn their inspiration from that corrupted well, adding a “communist” venom in making the faithful pastor of the Church, Mgr Pavao Zanic, the “tool of an atheist regime” — a supreme affront to a man of God. How desperate must they be, those Medjugorje propagandists, to resort to such “unchristian” stratagems in lynching a responsible pastor and concealing the truthful reconstruction of historical events? Taking all things into consideration, no private, confidential, or strictly confidential document can resist to the unveiling of verified, substantiated truth, especially if the aim is to right the public wrong caused by ill-advised public communicators. Especially when I know that the primary sources I submit are already in the dossiers of the Congregation for the Doctrine of the Faith for a quarter of a century. The said Congregation doesn’t seem to have intervened with necessary diligence in order to grant the former Bishop of Mostar the dignity and justice he deserved. Your remarks/comments/critiques will be moderated and should be identified properly with a valid name linked to a valid IP. The disobediance to the Bishop and the Pope and to the Church thats the real problem.Our LADY would not approve of such things. I have met and spoken with René Laurentin personally in Med. in the 80’s. From the twenty letters we exchanged, I could only conclude that he was not honest and that he tried to defend himself, rather than searching for the truth. Later I warned him that I should write an ‘open letter’ to him, and sent him the first page of it, asking him for a reaction. Because he never reacted I published this ‘open letter’, in which I explain his own contradictions and lies. Thank you so much, Diane, for taking the time to express, here, your encouragement and to refer, on your site, to recent articles written by those of us very concerned by the accusations against the former Ordinary of Mostar, Mgr Pavao Zanic. Excellent work, Louis. Thank you for providing the many details which give context to the controversial phenomena. I just linked to this, and other posts in my latest one, here: http://te-deum.blogspot.com/2012/02/medjugorje-commission-to-end-its-work.html. I am very grateful to you for your encouragement and prayers. That part concerning a fabrication and the private lives of two Franciscans (priest and sister) is not easy to submit. You write that “so many appreciate” the work I am doing. 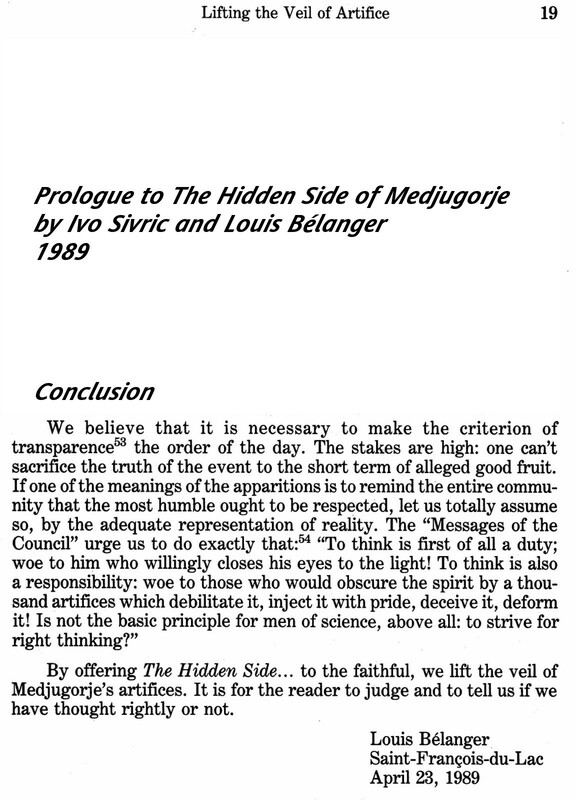 I guess that many more do not appreciate… The pages of the Prologue of The Hidden Side of Medjugorje that I reproduced (pop-up documents) in the last article were not well received in 1989, even if they were meticulously documented. Wilful blindness has perpetuated itself until today. In the second part of the article: “The facts”, I justify the term “fabrication”. As you know, we have to be sure that Fr. Laurentin had the intention to deceive, otherwise it is a “mere” untruth. For that, you have to point out that he knew the correct information and that he counterfeited it. This is all discussed in part 2 and we have the proof — through Laurentin’s own writings — that those conditions were fulfilled. Not only did Fr. 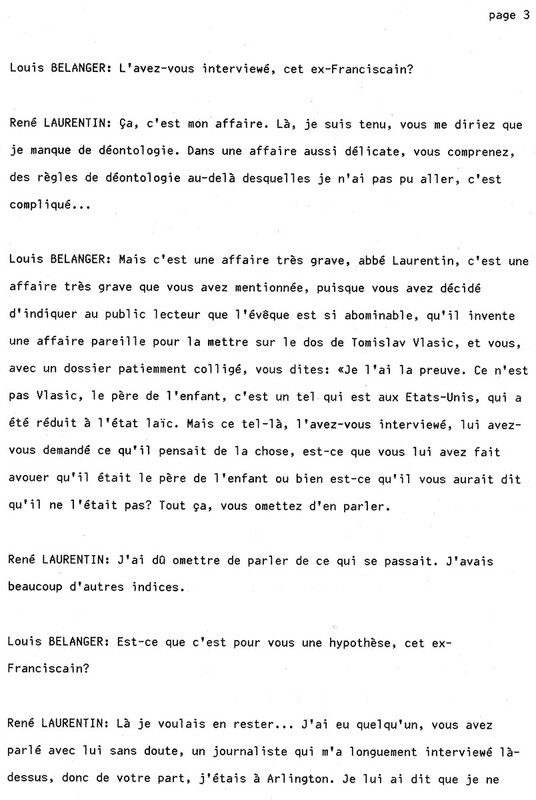 Laurentin have Mgr Zanic’s letter in his hands, but he had also some letters written by TV to MK, according to his own written acknowledgment. Moreover, what is important to know, is that the Medjugorje pastoral personnel knew exactly what Mgr Zanic knew, and even before Mgr Zanic, as the “rumor” circulated among the Franciscans since 1977. Today, we observe a new “twist” of the story first instigated by the mariologist and now by Croatian journalists, some vaticanists and other writers associated with the Medjugorje enterprise. Not only is the integrity of Mgr Zanic at stake, but also the credibility of the Church hierarchy. The late Ordinary of Mostar was deeply conscious of the consequences of such manipulations (see the end of his private report, source 8). Justice/truthfulness is done when the ins and outs of the case are revealed. Why may one think that Fr. Laurentin and Medjugorje Franciscans used and are using all means, first to annihilate (after the 2008 sanction) the special influence TV had on the visionaries between 1981 and 1985 — and later on to revive TV’s “sanctity” by vilifying the Bishop, with a handful of journalists helped by some vaticanists, if not for the greatest glory of the fabricated Lady of M and its political and financial fruits? Louis, thank you for all your hard work. So many appreciate what you are doing. May Our Dear Lord bless you abundantly, and may Our Blessed Lady wrap you in her motherly love and protection.